You are probably reading all the things to do in Atlanta during Superbowl weekend - all the parties, bars, places to go Downtown to watch the game… so, I am going to set the expectations right away: this is not an article about what to do during Superbowl weekend. It is a guide on what to in Atlanta, if you have some extra days in this city. I have been living here for almost three years, so all the places below are truly the places I love, and some might be off the beaten path, so if you have to Uber or drive, I can guarantee it is worth it. Have you heard of the Beltline? According to the Beltline official website: “First conceived as a 1999 master’s thesis by Georgia Tech student Ryan Gravel, the Atlanta BeltLine evolved from an idea, to a grassroots campaign of local citizens and civic leaders, into a robust new vision of an Atlanta dedicated to an integrated approach to transportation, land use, greenspace, and sustainable growth.” In order to understand it, you have to really immerse yourself in it - and I will suggest where you can start: right at Ponce City Market, which is one of the markets located in the Eastside Trail of the Beltline. The Eastside Trail was the first section of the Atlanta BeltLine trail to be finished. It has many restaurants and coffee shops along the way, and also some incredible murals painted by well-known artists. I recommend starting in Ponce City Market, and then walking all the way to Krog Street Market. You can ride a Bird, or walk, depending on the time you have available. My favorite murals are not on your way to Krog: when you leave Ponce City Market (you will see signs to the second floor of Ponce, where the exit to the Beltline is) you need to turn right and cross a bridge, and then continue walking from 5 to 15 minutes until the murals below (photos include murals from Greg Mike, Alex Ferror and Adam Fu - I am missing some names here but I will update soon!). How cool are these, right? Super instagrammable! I love how the Beltline promotes wellness, art, local culture, local and small shops… it has so much to offer! If you want to see more of the Beltline I highly recommend a tour! Official Beltline tours here. Book in advance! I recommend the following places: New Realm Brewery (cool rooftop), Lotta Frutta (for ice-cream and smoothies), Ladybird Grove & Mess Hall (brunch or drinks with a dog-friendly patio), Three Heart Roastery Coffee Shop, Spiller Park Coffee (inside Ponce), Root Baking Co. (also inside Ponce) and King of Pops for a delicious popsicle. All my restaurant recommendations can be found in my Instagram, or through the hashtag #dicasdeatlanta. - Ponce City Market has the famous “Ponce Roof” with a restaurant and bar and entertainment space (see image below). - The new Moxy Hotel has a rooftop - I visited this last week and I loved it. Totally worth it! - Hotel Clermont also has an incredible rooftop bar with great views (it is a few blocks from Ponce) - expect long lines! They also have a french restaurant that I heard great things about. Coffee shops: my favorite coffee shops are - any of the Octane or Revelator spots in town, Dancing Goats (Buckhead and Ponce location are great), Muchacho (love the decor, breakfast tacos and coffee), and East Pole Coffee (great spot if you need to also do some work while you drink your favorite caffeinated drink). Bars: if you are in Buckhead, a place that a lot of locals go to is The Ivy - it is fun and has DJ / music during the night. Gets super crowded, so expect lines! I don’t really go out that much in Atlanta, so I don’t have the best recommendations here. Eclipse di Luna is pretty cool and drinks are cheap! -When the weather is nice - highly recommend Canoe, it is beautiful and I recommend seating outside. -Buteco is a Brazilian bar in East Atlanta, new and super cool. -Gunshow is incredible and reservation is a must. The concept is super cool. -Southern food - South City Kitchen (I don’t really eat a lot of Southern food, but this place is pretty good). -Great brunch at General Muir and Buttermilk Kitchen (did someone say Fried Chicken Biscuit!?). -Korean Food at DISH (my favorite!) in Buford Highway area. -Vegetarian options at R Thomas Deluxe Grill and Cafe Sunflower (I love both! R Thomas has the best mate with juice). -If you get stuck in the Airport, you can take a quick Uber to the best Cuban in town - Mami’s La Cubana. -On the healthier side: for smoothies and quick bites I recommend Kale Me Crazy, multiple locations in the city. Sama Food for Balance is also another spot I love, it is super casual and the food is awesome (breakfast bowls, lunch/dinner bowls and different types of coffee drinks). Last but not least, True Food Kitchen at Lenox Mall. -Pizza: Varuni Pizza (real italian pizza). My go-to. -Steakhouse: Bones, Hal’s, Little Alley Steak…all great and $$$. -East Atlanta has been one of my favorite area to explore recently. 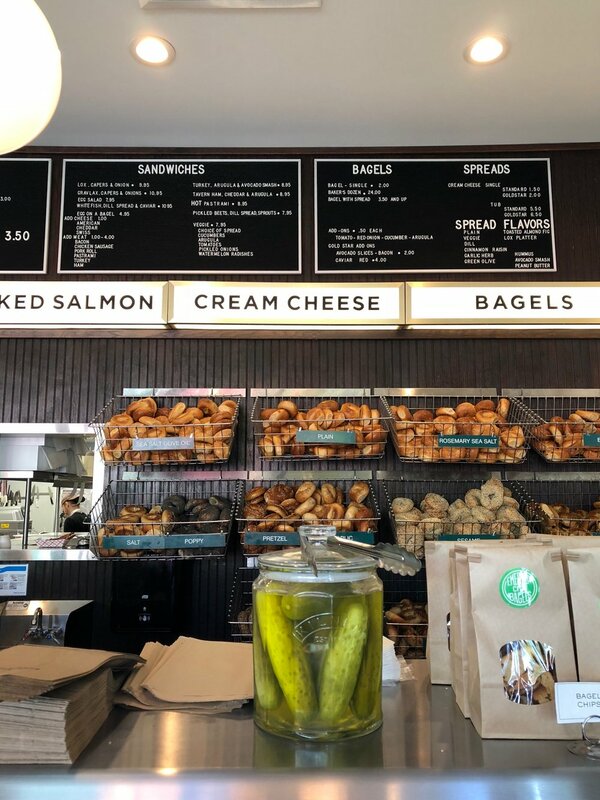 Some places I highly recommend: We Suki Suki (I have NEVER been but I heard amazing things) for Vietnamese food, Emerald City Bagel - get there early, the bagels are incredible!, Buteco (the Brazilian spot). So many places I love. I think this is a good list for you to try to go if you have some days here. Our most famous park is Piedmont Park - I visited during the fall and it is beautiful. It is a great place for a walk/run or just to appreciate the views of the city. It also hosts several events throughout the year, so check out their website to see what will be happening when you are in town! I also recommend going to the Aquarium and High Museum of Art if you have some time! My advice is to buy tickets in advance / online. Reformer classes: Stellar Body in Buckhead and Midtown. Barre classes: Forme, Pink Barre, Exhale Spa (it is inside Lowes Hotel) and FlyBarre (from Flywheel) are my favorite Barre classes. I hope you enjoyed my list of things to do in Atlanta, and places to eat! Please let me know if you have any other questions. I will keep updating this list as I discover more places in the city, also feel free to send me your recommendations in the comments below or via Instagram.